I had some time off and as I was still in the festive mood from the Diamond Jubilee and The Olympics so I thought I would finally go and see Buckingham Palace. The Queen opens it up for 9 weeks every year whilst she is away on holiday. Usually you can get the Royal Day out ticket which allows you to see Buckingham Palace, The Royal Mews, the Queen's Gallery and Clarence House but Clarence House was closed this year. It is not cheap to visit here and that was one thing that has put me off going here and also I had heard mixed reviews from my friends. It does help for the up keep of these beautiful and historic buildings though. You can see some of the pictures I took that day here. I recommend you get the tube to Green Park and walk down from there. Buckingham Palace became the royal residence for the monarchy when Queen Victoria came to power. She need more space so they had to extend the house. The newer addition is the front bit you can see from the Queen Victoria fountain. Marble Arch used to be located where the new addition is which was relocated to the corner of Hyde Park. I thought that Buckingham Palace was a beautiful place. The free audio guide was great as you could choose whether you wanted to know more about some of the items around the house. At the time i went they had a special display of diamonds as it was the year of the Queen's Diamond Jubilee year. I really like it but there were too many people and whilst the line was already going slow, some people were stopping for way too long to look at the diamonds holding up the people behind them. You cannot take pictures inside. The Royal Mews is where the horses are kept for the Queen. I liked this place because I was able to see some of the cars that I have seen her in during her visit to Cambridge. I was also able to see the carriages used for the Royal Wedding. I didn't take the free audio guide and found that the signs informative. Also some of the staff still live here. The Queen's Gallery opened in 1962. It often has special exhibitions and when I went there was a Leonardo Da Vinci exhibition of his drawings of the human body. It was nicely displayed. You can take pictures here but with no flash. The good thing is that if you have been here once, you can return within a year for free as many times as you want if you get your ticket stamped before you leave. So I intend on going back next year to the what display they have out. I wish I had gone last year because Kate Middleton's dress was displayed. I am a royalist so this was up my alley. It was nice to see the coaches and cars that I have seen. Also the more I visit in London, the better my understanding of the history and people becomes. I suggest that if you are not huge on art, don't bother going to the Queen's Gallery. 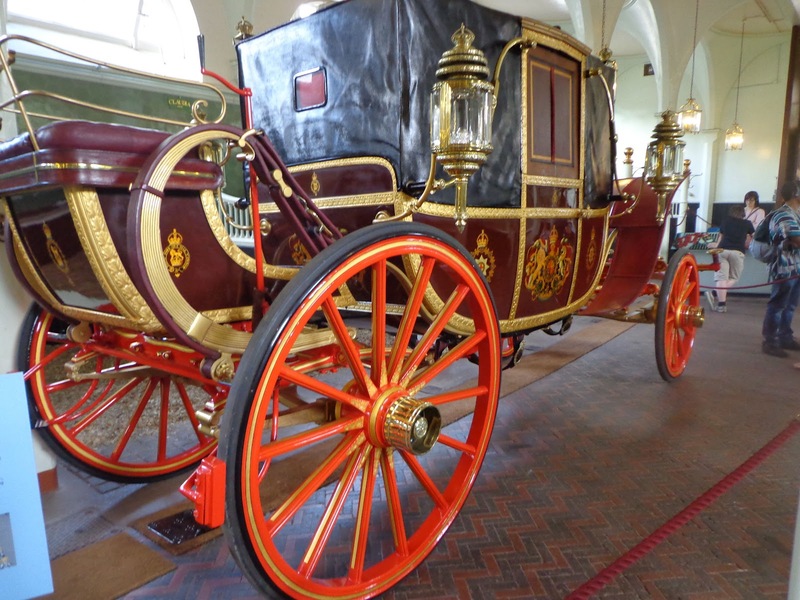 The Royal Mews is nice and they have a great area for children to do some crafts. but I recommend if you just want to get a small dose of how the Queen lives, just stick to Buckingham Palace. Saying that, you could make a great half of a day at the attractions and spend the rest of the day picnicking and napping in St James Park or Green Park (weather permitting) which will bring down the costs.